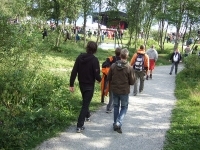 First staged in 2004, Bukta is a relatively new event on the music calendar and known as the festival where the sun never sets. Held during summer in the northern part of the country in the city of Tromsø, the festival boasts the natural splendour of snow-capped peaks and the Arctic Ocean as a backdrop to some of the finest in local and international music. Apart from the best of what Norway has to offer, past international performers include The Hives, The Tallest Man on Earth, Kaiser Chiefs, Juliette Lewis, Iggy Pop & the Stooges, and Supergrass. The festival has steadily grown in size and popularity since it was first held. It currently consists of three main stages, lasts three days, and attracts thousands of people. Tromsø is usually a peaceful, even sleepy place. But for this one annual weekend, it is flooded with festival-goers keen for a celebration. It is a quirky festival, not yet as mainstream and commercial as some of the big international festivals, which is part of its charm. Those seeking something a little different on the music festival scene will enjoy Bukta. How often do you get to party in the arctic?